Gentedimontagna contributor and food writer Andrea Arria-Devoe hangs ten at a farm-to-table institution in Bondi Beach. 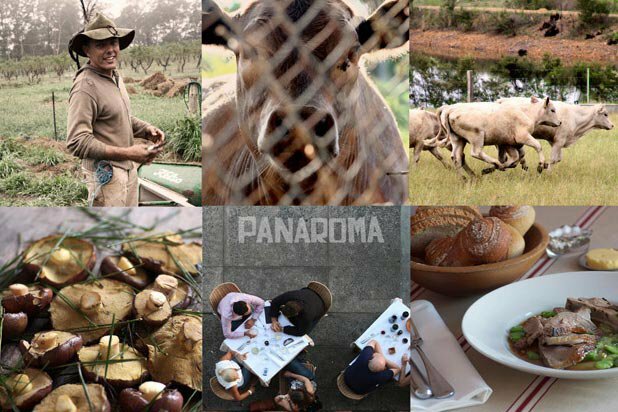 Even if you're only toying with the idea of a visit to Bondi Beach, it’s wise to make a reservation at , a tiny farm-to-table institution, way in advance. My husband Mike and I got extremely lucky: We were under the impression that they didn’t take reservations, and the one night we snagged a babysitter, we walked over prepared to wait, only to have the host laugh in our faces when we asked if he had room for two. Mike laid the Irish guilt on thick and told them we came all the way from Los Angeles just for the food and we were leaving tomorrow. (No one needed to know we were there for another two weeks.) As we walked out the door in a cloud of disappointment, a waiter ran into the middle of the street and told us he could seat us as long as he had the table back by 8:00 — a harbinger of friendly service to come. The vibe is laid-back — surfer meets farmer Zen. Everything on the weekly-changing blackboard menu is locally sourced, mostly from the restaurant’s farm in Bilpin. Going on thirteen years strong, there is nothing bandwagon about chef Sean Moran’s unpretentious, ingredient-driven food. It’s arguably the epitome of modern Australian cuisine. House-made bread and butter is impossible to resist and whets the appetite for olive-oil braised snapper, roasted guinea fowl, and seasonal nougat. The best part of my meal was an emerald greens soup with a fat oyster at the bottom of the bowl like a crackerjack toy. I can still see the color. Lunch is also a good bet for a leisurely afternoon spent sipping crisp white wine and gazing out towards the waves, but it's only served Friday, Saturday, and Sunday. In other words, plan ahead. Andrea is a freelance writer/staff mom living in Los Angeles. She travels for the coffee and chocolate. Узнайте про важный сайт про направление www.best-mining.com.ua.